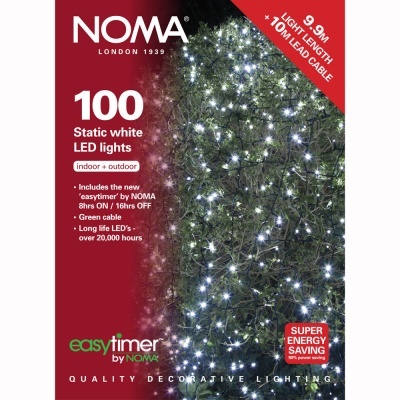 Noma® Static White LED Christmas lights add a bright glow to your artificial or real Christmas tree. 100 white shadeless LED static decorative lights suitable for indoor & outdoor use. Noma® LED lighting not only saves energy but each bulb has an expected lifetime of an incredible 20,000 hours. Using a low voltage transformer these long life lights are suitable for outdoor use to light up trees, shrubs, porches or doorways. Each white LED is 5mm in length and 100 LEDs make up this straight line construction set. Noma® ‘Easytimer’ system is included within this set, which ensures the lights stay on for 8 hours / off for 16 hours programmatically.